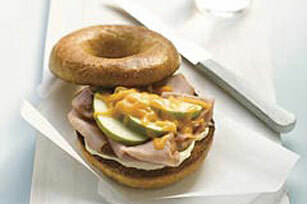 Experience an unexpected taste combo with our Ham & Apple Bagel Sandwich Recipe. Sweet, tart and tangy, this bagel sandwich recipe is something to behold. Spread bagel halves with dressing. Top 1 half with ham, apples and cheese; place on microwaveable plate. Microwave on HIGH 30 sec. or until cheese begins to melt. Cover with remaining bagel half. Prepare using OSCAR MAYER Deli Fresh Smoked Turkey Breast.